We will be building the examples in this post over this solution, so we will have some predefined CSS styles already in place but you can start as well from a completely new solution. Let’s start with the necessary DB tables: [dbo]. [Users] and [dbo].[UserRoles]. Below is the SQL script for creating and populating these two tables with some default data. Next we will update the edmx model to include users and user roles and then we shall add a new controller called UsersController. By default our controller will have an action method called Index. Let’s add a view for the Index method and display the list of users that aren’t deleted. First we will fetch the list from the DB inside the controller and pass it to the view. Note: For the moment, I will concentrate mainly on the user interface and I will put all the server side logic intro the controller but lately we will refactor our application’s architecture using a view model and applying the repository and unit of work patterns. If you run now the site, you will see a table with all the users in the DB. Helps to separate the application layers providing a simplified model for obtaining/persisting data. Makes it easier to implement unit testing because it provides an easy way of defining test repositories that create in-memory dummy collections and use them for testing instead of accessing the real data source. You can find a complete explanation of the Repository Pattern on MSDN. Leave transaction control to the client. Although the REPOSITORY will insert into and delete from the database, it will ordinarily not commit anything. It is tempting to commit after saving, for example, but the client presumably has the context to correctly initiate and commit units of work. Transaction management will be simpler if the REPOSITORY keeps its hands off. After this brief introduction, let’s use the repository pattern in our example. For the moment, in order to keep things simple, we will define only a data retrieval method and later, in the next post, we will add data persistence methods as we will define the add/edit/delete user functionality. /// Method used to build the query that will reflect the filter conditions and the sort expression. Now, we will change also the controller method to use the repository. The down-side of this implementation is that the controller has to provide a context, meaning that it’s still tightly coupled with the DAL. You can say that we could move the creation of the context inside the repository. This is true but contradicts with the recommendation mentioned just a little before: “Leave transaction control to the client”. It’s true that for the moment we are only retrieving data, so we are not concerned about transactions, but soon we will need to add in our repository Add,Update and Delete methods. In order to remove this problem we will use the Unit of Work pattern. Maintains a list of objects affected by a business transaction and coordinates the writing out of changes and the resolution of concurrency problems. […] A Unit of Work keeps track of everything you do during a business transaction that can affect the database. When you’re done, it figures out everything that needs to be done to alter the database as a result of your work. Add a new method to the repository for returning data in a paged manner. Add a pager in the View so the user can browse between the pages. We want to allow the user to sort the list by first name and last name. To enable this we first modify the controller action to receive two new parameters, the sort column name and the sort direction. In this step we will add a text box and a search button to allow the user to filter the list by name and/or surname. These controls will be placed in the view inside a form so we are able to post the data to the server when the user click the submit button. Now, we are able to filter the page but, if we filter the page and then we sort or change the page number the filter will be lost. To solve this we need to remember the filter value in our page number and sort column links so we will pass the filter value in the RouteValueDictionary for both sorting and paging. /// The number of elements to display in the list. Default is 10. /// The current page to be displayed. Default is 1. /// The column on which the sorting is applied. /// The direction of the sorting. Default is ascending. /// Get the current sort expression. /// Used to specify the related objects to include in the result. /// Returns the elements for the current page. The list is filtered and sorted. /// Returns all the elements that match the filter condition. The list is sorted. 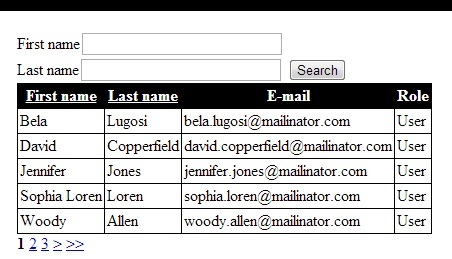 /// Helper methods used for setting the current page number, the column to sort on and the sorting direction. /// Get a list of name and value for all the properties inside this class that are marked with the ListViewFilterAttribute. /// Populate the model filter properties using the filter values. Here you can notice an extension for the UrlHelper class Url.GetRouteValueDictionaryForList that was created to easily build a RouteValueDictionary that is used to create the URLs for paging and sorting so that the filters, the sort criteria and the paging is not lost when the page is refreshed. In this post we created a list that supports paging, sorting and filtering. In the end we extracted the reusable parts in a generic class that we can use as the base for our lists. You can download the complete source code from Codeplex.